What is today about? It is about everything real and everything that matters. It is about the lushness of the startlingly green grass that surrounds us, fed by the copious rain of the past few months. It is about the reddened white of the dogwood, the gentle lavender of the lilac, the vivid orange of the marigold, the presumption of the peony. It is about the windows in Chartres cathedral, the dome of St. Peter’s, the smile on the face of the putti who peer down at the worshipper or the gawker in Sant’ Andrea al Quirinale in Rome. It is about parades and marching, about bands and color and sound. It is about sacrifice, especially those who have given their lives for others. It is about the beauty of the human body. It is about people, about mothers, fathers, grandfathers and grandmothers, about teenagers, about little kids—all the uniquely real and all part of the whole creation of God. It is about Christmas, the Birth. It is about Good Friday, the Death. It is about Easter, the new Life. It is about Spirit who breathes and gives life. It is about God who is Father, Son and Holy Spirit. Ultimately this feast is about God, because this feast is about everything that there is. It is about God because it is the feast of material reality, the affirmation loud and clear that God created all things and said: This is good. This is when we say to a world that thinks that all you see is all you get, we say that God not only sustains all that there is, visible and invisible, but who now uses it to convey his power, his glory and his grace. 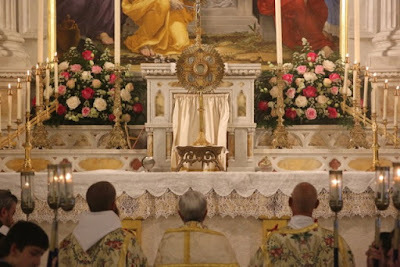 This is the feast on which we celebrate our basic belief as Catholics that all reality is sacramental, shot through with the glory of God, that all physical reality is being transformed by the power of God in Jesus Christ through the Holy Spirit—and that physical reality itself has the potential to be transformed into God himself. This is the feast that demands we go beyond, far beyond, this is the feast that leaves far behind the reduction of worship to entertainment and sentimentality, a frozen popsicle of the 1960s. My favorite line from the Sequence for this feast, which we just heard sung, written by St. Thomas Aquinas is this:quantum potes, tantum audes. Dare to do as much as you can in giving Him praise. This is not merely one more feast; this is a feast of extravagance, a feast redolent with the costly perfumed ointment poured out with such love on Jesus’ feet before his death. A feast that engages the senses, which goes beyond the body to the body of Christ, the Body of the Lord, Corpus Christi. This is the feast that reminds us of the physical ground of our spirituality, our grounding in the Word made flesh. This is the feast that reminds us of the physical ground of our spirituality, our grounding in the Word made flesh. This is the feast that is the antidote to the deadly poison of tedious spiritualization that takes Christianity our of the real and into the vapidity of moralism and self-congratulation. This is the feast that celebrates the triumph of Easter, the only triumph worth celebrating. But it is also the feast that comes out of the relationship within God himself. Only because God is loving relationship in the Holy Trinity can we relate to him, can we love him, and be loved in return. This is the feast of love, what it is and what it does: nec sumptus consumitur, in St Thomas’ words: love does not consume; it gives and in giving it receives. And with the procession at the end of Mass, we not only bring Christ into the world, our world of Norwalk. In this act we inject Catholic culture into the world. This is not some culture that is associated with the Middle Ages. This is the culture that is the fruit of the life of a world into which the infinite God of truth, goodness and beauty became finite, one of us, in the tabernacle of the womb of Mary. This is the affirmation of a Catholic culture that does not dwell in a ghetto, that is never drawn in on itself, that is not afraid of the secular world, but rather affirms a true culture of life. It is the affirmation of wintergreen and new mown hay and the steam of chicken soup. It is the affirmation of chant, of Palestrina and Byrd, of Bach, Mozart and Mahler, even Messaien. It is the affirmation of the luminous icons of the Eastern churches, of Fra Angelico, of Michelangelo, of Bernini, of the tender velvet of veal scallopine, of the dancing on the tongue of a good Brunello, the deepness of a mousse de chocolat. But this is also the affirmation of home made bread dipped in home made wine, the kielbasa and sauerkraut, the chicken quesadilla, the fried baccalà, the hot dog with the yellow mustard at a family picnic, the briny surprise of an oyster. This feast is the affirmation of the artisans and artists who have made this church so beautiful, of Alonso, of Carlos, of Rosalino, of Henry, of Peter, of Rosario, all purveyors of the beauty of God. This is the affirmation of a pick up basketball game, of the sitting out on the stoop on a warm summer’s night with the sounds of chatter and laughter, of the first communion dress that somehow grows into the prom dress and into the wedding dress. This is the feast of pink-skinned babies, the affirmation of wrinkled hands and of lined faces, the affirmation of the extraordinary beauty of ordinary life. And it is all of this that we affirm on the feast of Corpus Christ and that we celebrate in the procession. It is we who bring Christ to the world. It is we who accompany him in the beauty of music and vestments and incense And by our going out into this neighborhood, it is not only we but also those who do not know Christ, those who have no idea of what is going on: we are all blessed by the Body of Christ as he blesses us all on his way. Quantum potes, tantum audes: dare to do as much as you can. And what we dare to do today is to worship the living Christ, the beauty of God, and to bring that beauty into the world.